WHAT IS THE CARTIVA® SCI? The Cartiva® Synthetic Cartilage Implant (Cartiva SCI) is a man-made (synthetic) implant that is made of a soft plastic-like substance (polyvinyl alcohol) and salt water (saline). These materials are combined and molded into a solid, slippery and durable implant. The implant replaces the damaged cartilage surface of the big toe that functions similarly to natural cartilage. WHAT IS THE CARTIVA® SCI USED TO TREAT? The Cartiva SCI is intended to treat painful arthritis in the joint of the big toe (first metatarsophalangeal joint). This arthritis of the big toe, also known as osteoarthritis or “OA”, involves the wearing down of the cartilage tissue located in the big toe joint. The worn down cartilage can cause pain. HOW DOES THE CARTIVA® SCI TREAT ARTHRITIS OF THE BIG TOE? The Cartiva SCI is made to replace the damaged cartilage surface of the big toe. The implant is placed into the bone in your big toe. 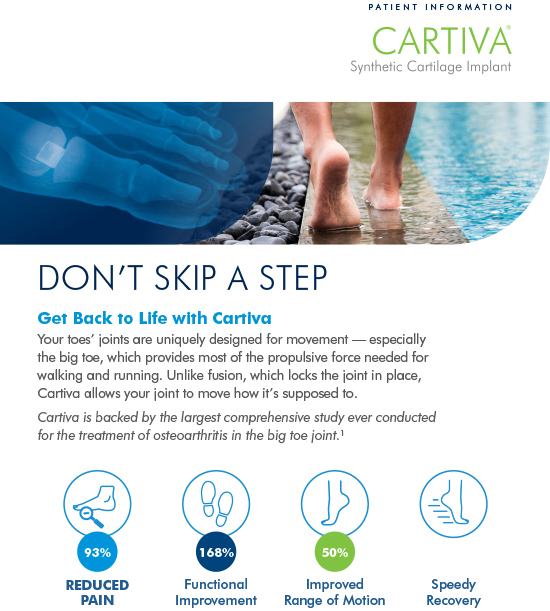 The Cartiva SCI provides a new smooth, slippery surface in the joint. As a result, the Cartiva SCI may help relieve the pain and stiffness in your big toe caused by the worn cartilage. To find out if you are a candidate for this innovative solution for the arthritic great toe joint, contact our office to set up an evaluation. Our staff will arrange a convenient appointment.